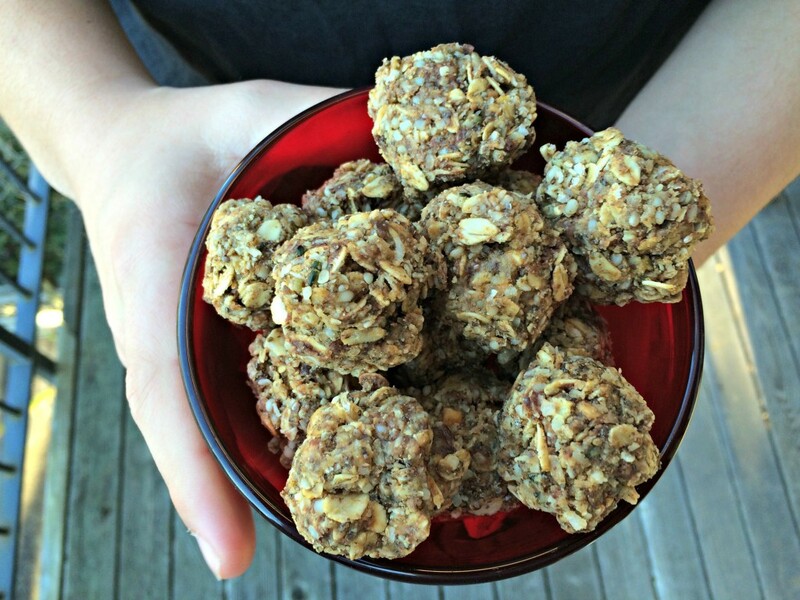 Snack recipes to fill the hungry time between meals. When I was a kid, occasionally my mom would make Chocolate Chow Mein Noodle Cookies. I, of course, thought they were the bomb and gave no thought to all the processed ingredients in the noodles or conventional chocolate chips! I still often feel a nostalgia for some of the “treats” of my childhood but now I have begun to look for ways to make them healthier. This recipe came out of that nostalgia. I knew I wanted to keep the feeling of the noodles covered with chocolate but without the unhealthy fat you get from using a fried noodle. I decided to use Bob’s Red Mill Organic Oats to take the place of the noodles. Also, I wanted to incorporate more protein and healthy omega-3′s in this snack so I added Trader Joe’s Organic Tricolor Quinoa, Navitas Naturals Organic Raw Chia Seeds, and Manitoba Harvest Hemp Hearts. I added cinnamon for its blood sugar balancing and anti-inflammatory properties and cardamom to aid in digestion. Finally, instead of using regular milk chocolate, I switched to Newman’s Own Organic Premium Chocolate Bar, 70% for all the heart healthy flavonoids that come with dark chocolate. These were VERY easy to whip up and don’t require any baking! Everything all mixed up and ready to go in the muffin tins. I made sure to press hard on the oat mixture as I added it to each tin so all the ingredients would be compressed and hold together better. 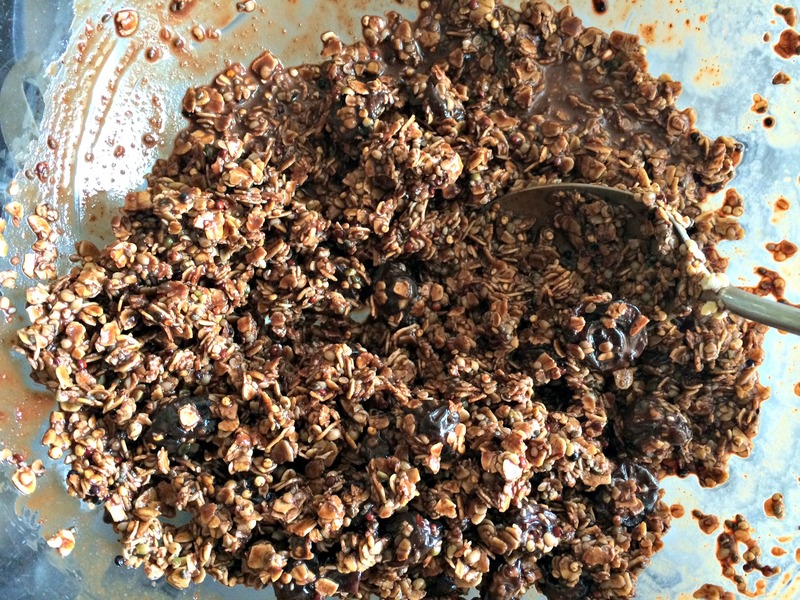 Chocolate oat mixture before it hits the fridge. Treats all ready to eat. Toast quinoa in a dry pan. Shake pan often to keep from sticking and/or burning. Remove from fire when quinoa is lightly toasted. 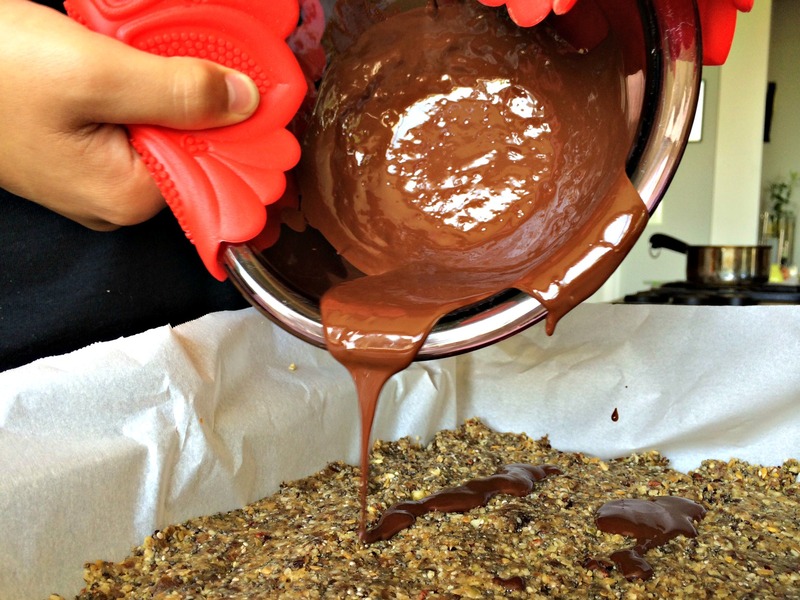 Put chocolate, coconut oil and cocoa powder in double boiler and melt over light heat. Once melted, stir in the cinnamon, salt, maple syrup and cardamon. Taste to see if sweet enough for your taste. If not, add more maple syrup. 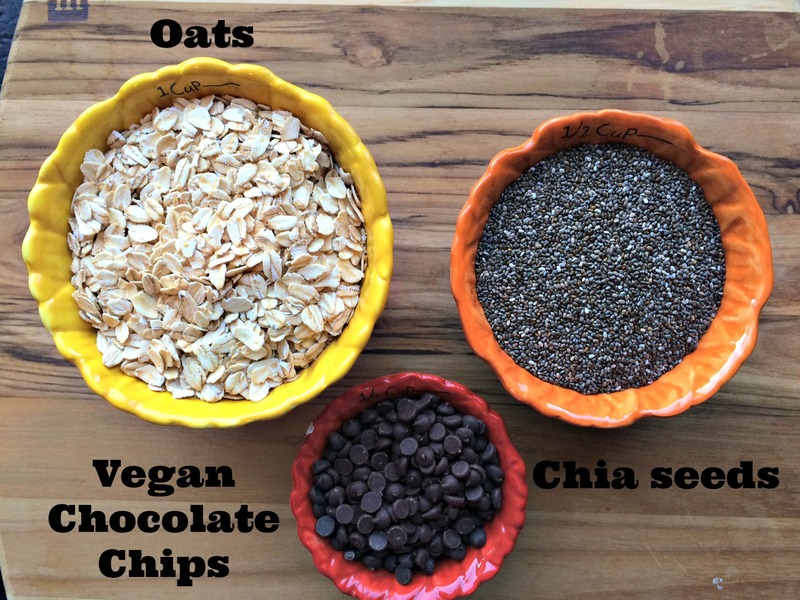 Once combined, stir in the oats, quinoa, chia seeds, hemp seeds and dried cherries. Stir until all the dried ingredients are covered with chocolate. Spoon "dough" into lined muffin cups. These will keep best in the fridge. This post was added to Fiesta Fridays. 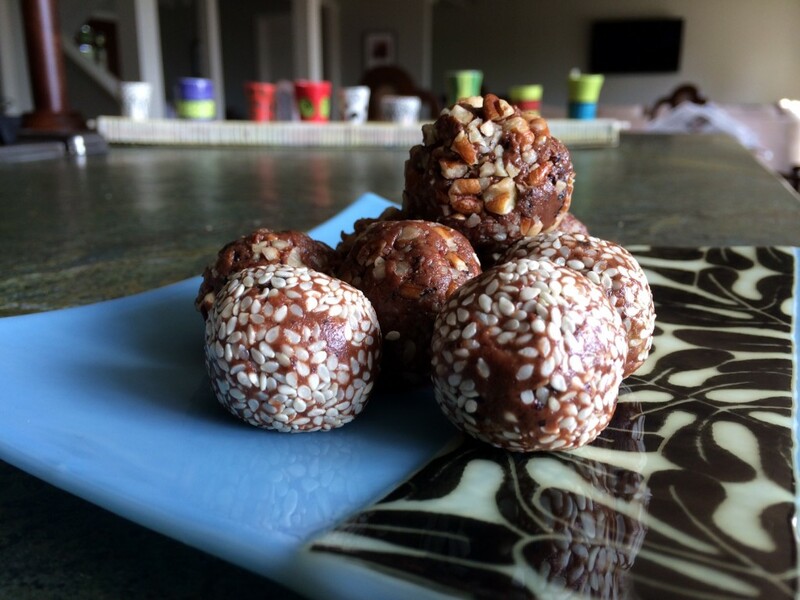 Dark Chocolate Nut and Seed Blasts- Good for your Heart! 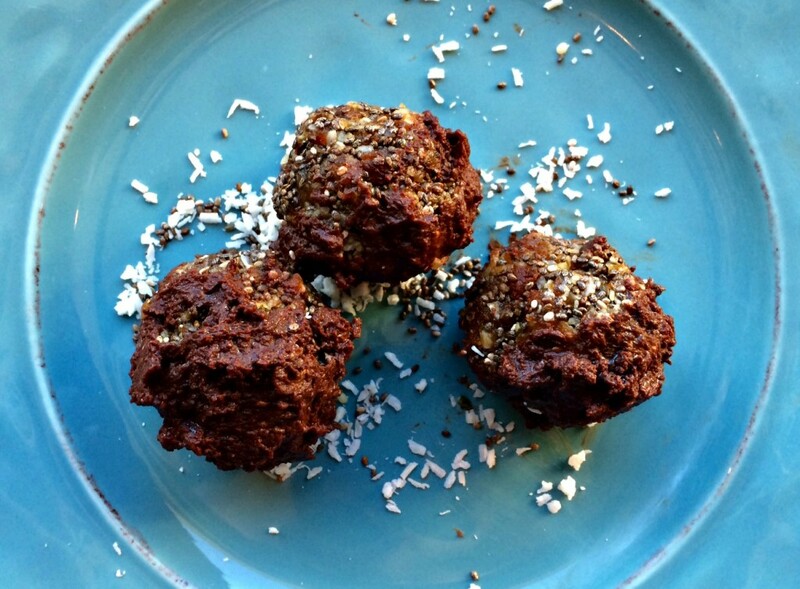 I have been so intrigued by all the raw truffle recipes on Pinterest. Every time I see a recipe for truffles or energy balls, I have to click over to the actual website to see how they are made. I can’t believe how many different versions there are! After reading so many recipes and dreaming about how yummy they all sounded, I decided to try to make some of my own. 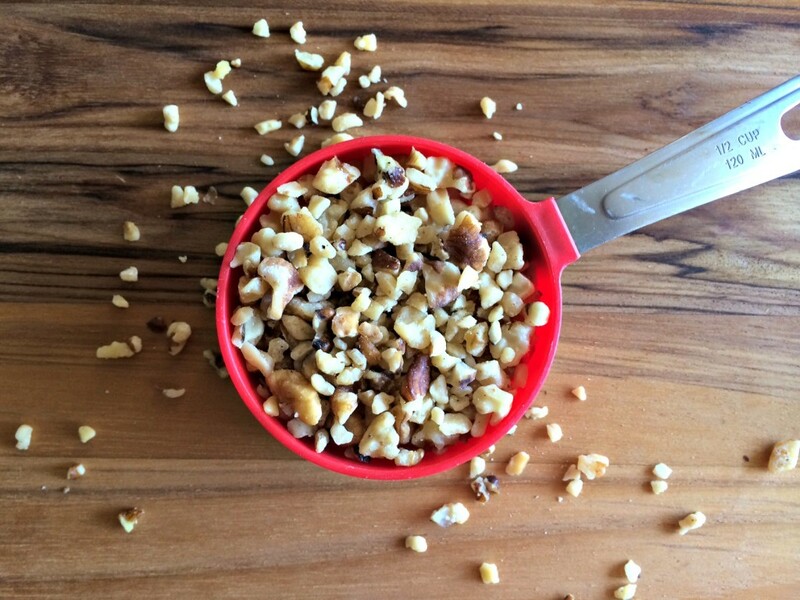 Chopped walnuts for healthy omega-3′s. 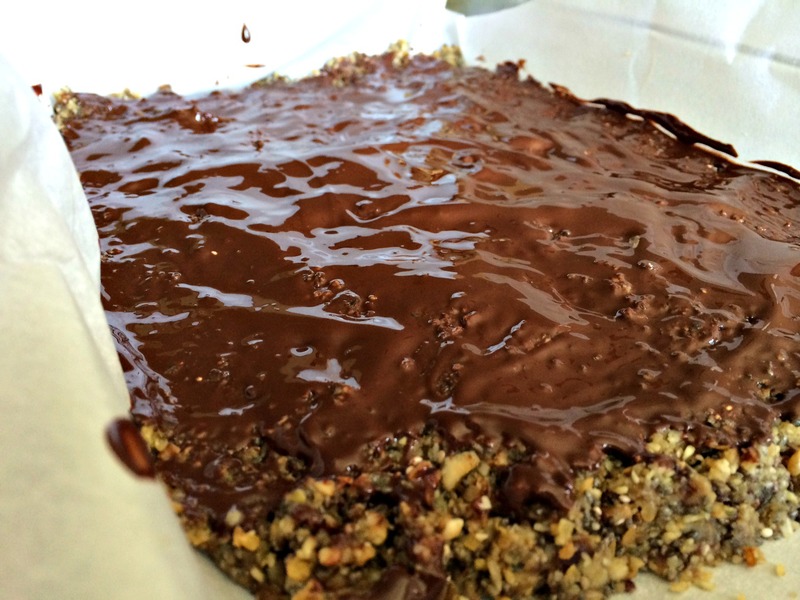 After grinding up the dates, nuts and seeds, I added the melted dark chocolate. The dough turned a beautiful, rich brown color and tasted so yummy! Dough all ground up before heading to fridge. 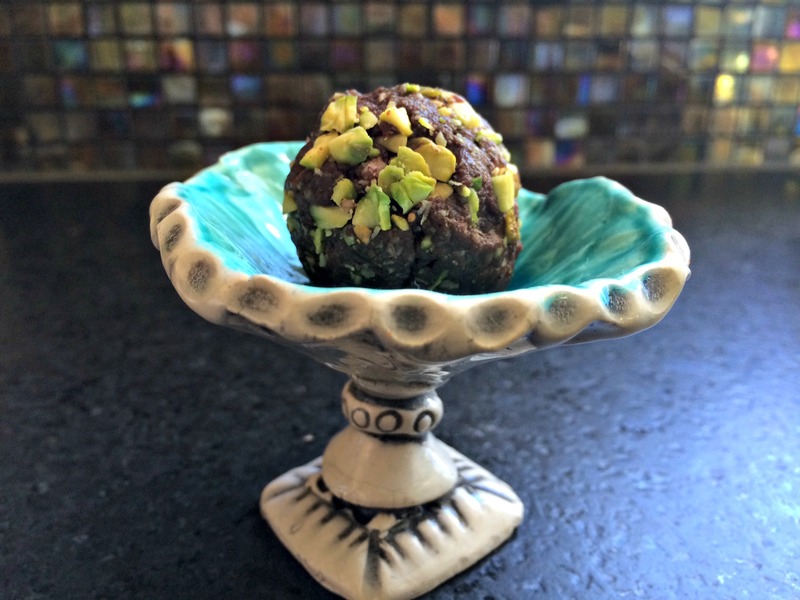 I found the balls rolled the easiest by squishing them into loose balls and then rolling them in the chopped pistachios. 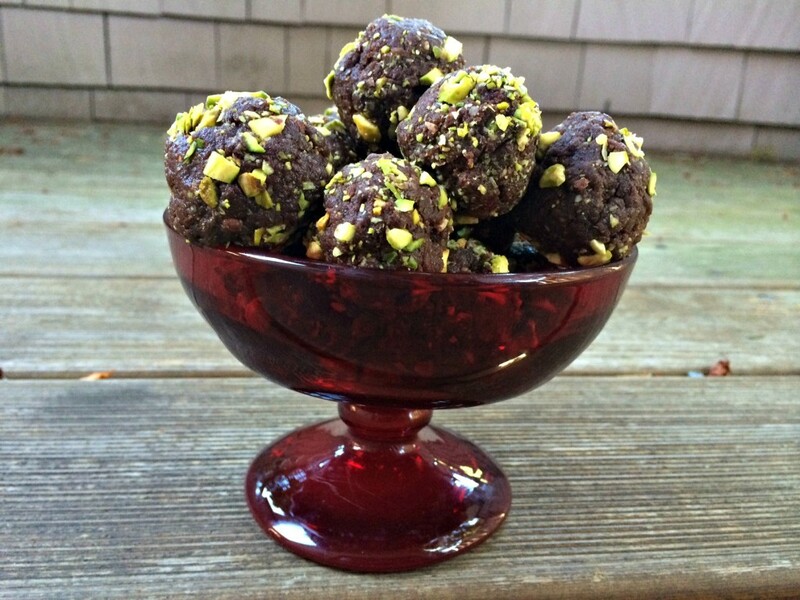 After they were lightly covered with pistachios, I would roll them into tighter balls. 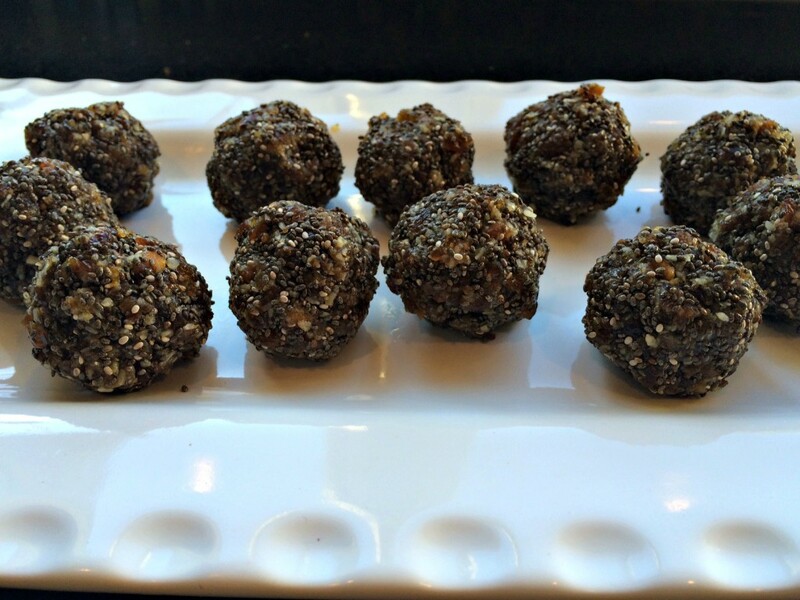 (Unfortunately, my ball rolling skills aren’t perfect- the balls are a little lopsided but they still taste delicious!) It also seemed best to VERY finely chop the pistachios. They adhered the best when finely chopped! Blasts all ready to eat. 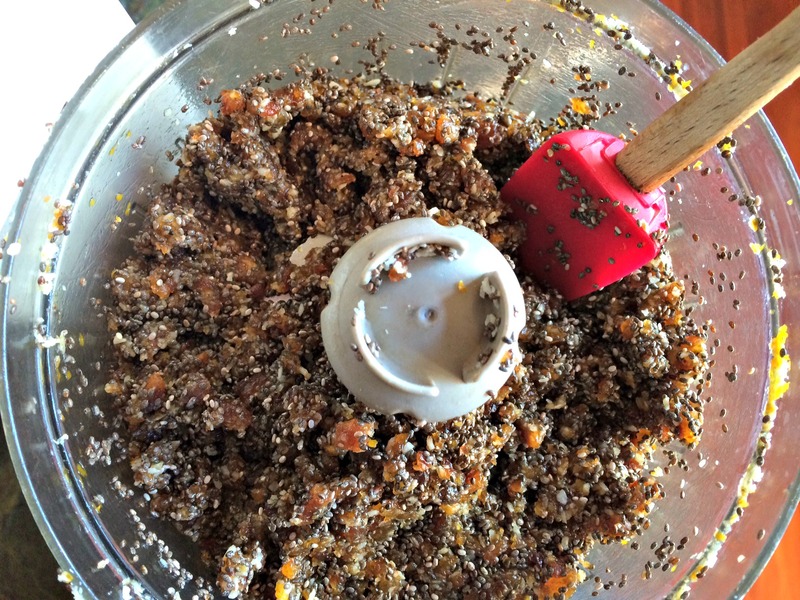 Grind pitted dates in a food processor fit with an s-blade until a paste forms. 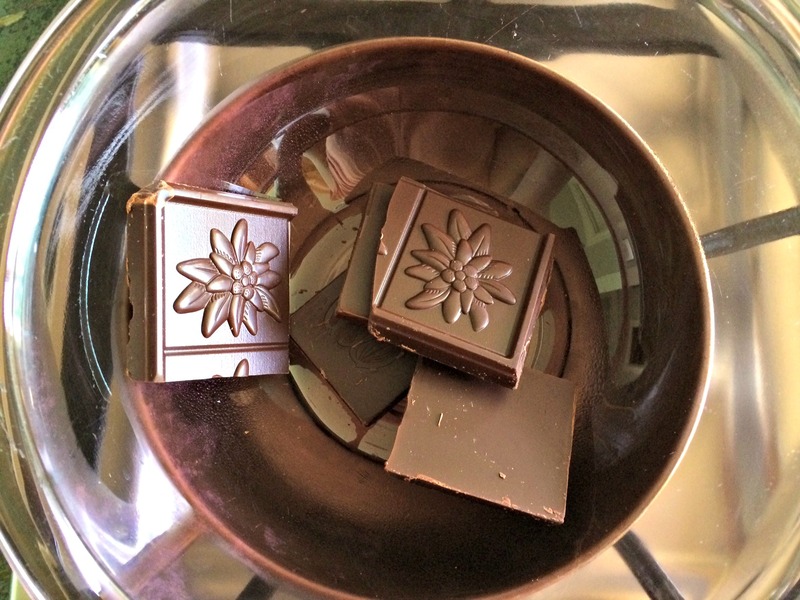 Place chocolate in a double boiler over low heat, stirring occasionally until melted. Add walnuts and pulse until combined. 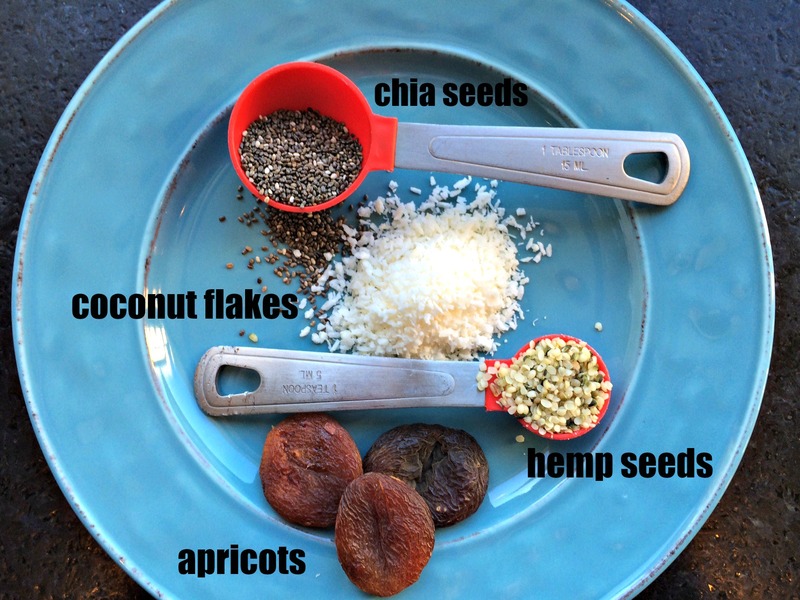 Add hemp seed, almond milk, cinnamon, cardamon and sea salt. Pulse until well combined. Add in melted chocolate and pulse until well mixed with the nuts and dates. You may have to stop and scrape the sides a couple of times. 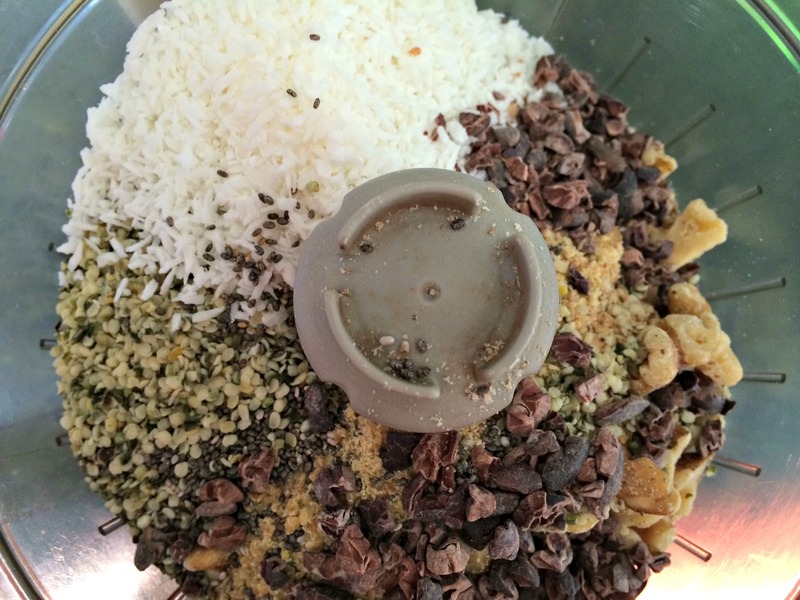 Place food processor bowl in the fridge for about 20 minutes. 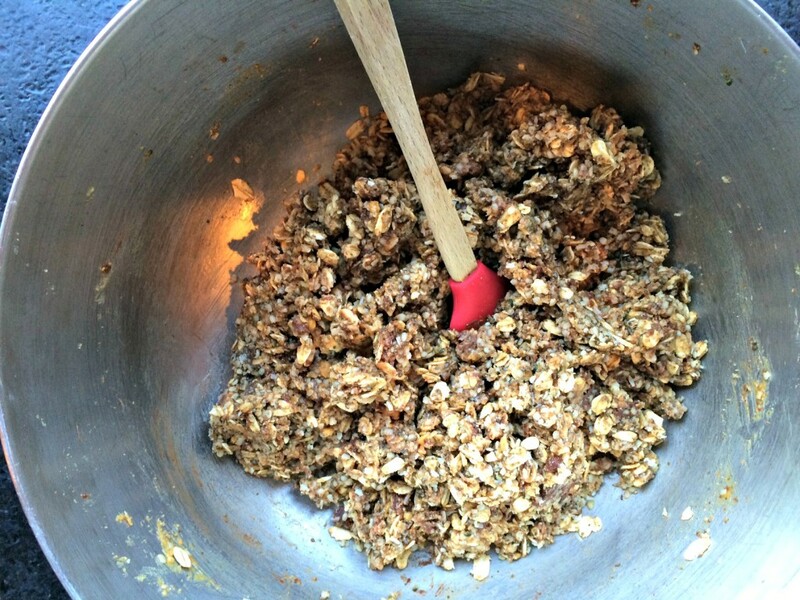 Take nut mixture out of fridge and carefully roll the dough into balls. 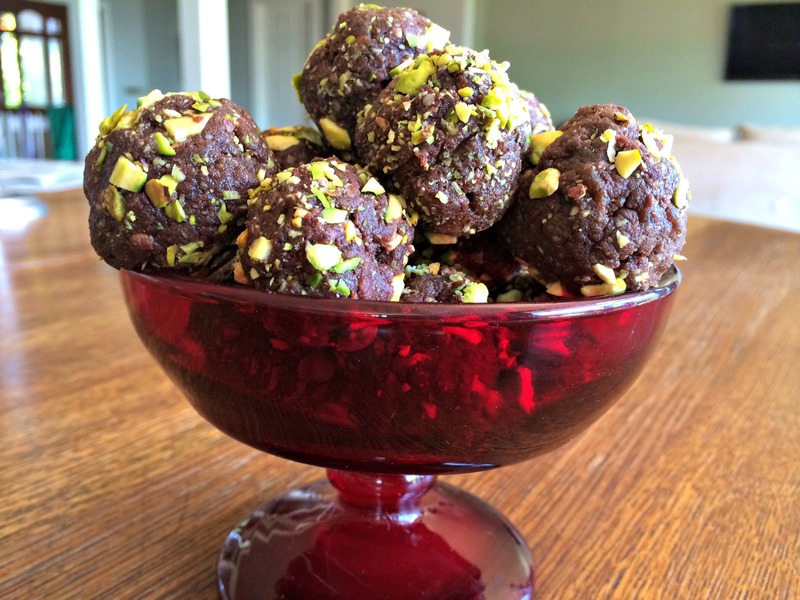 The balls can be rolled in chopped pistachios or other nuts according to your tastes. A single blast of nutty goodness. I love the bright green of the pistachios contrasted with the brown of the chocolate! It is so pretty! A whole bowl of nutty goodness. Feel free to substitute different nuts or nut butters for any of the ingredients. I think you can never go wrong with a nut. Enjoy! Shared with Rock My Vegan Socks, Girl Meets Nourishment, Today’s Creative Blog, The Novice Gardner and Real Food Fridays. Summer has definitely hit and it seems everyone is on the move. People are visiting family, headed to the beach or checking out the National Parks. I can’t wait til we get to hit the road. 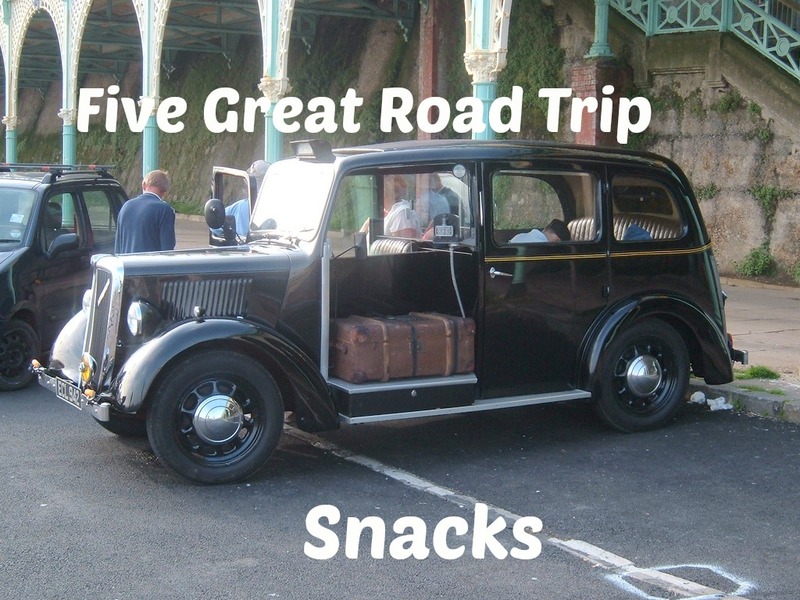 Beyond the hassles of packing, boarding the dog and planning the trip, one of my biggest concerns is what to bring for car snacks. I don’t want to undue all the healthy eating we have been doing at home by failing to be prepared!! It never fails that we have barely made it out of the driveway and the kids are already asking what we have to eat. I have been giving this a lot of thought and this year I am prepared. Here are five snacks I will be packing. Blueberries. Blueberries are an amazing car snack. 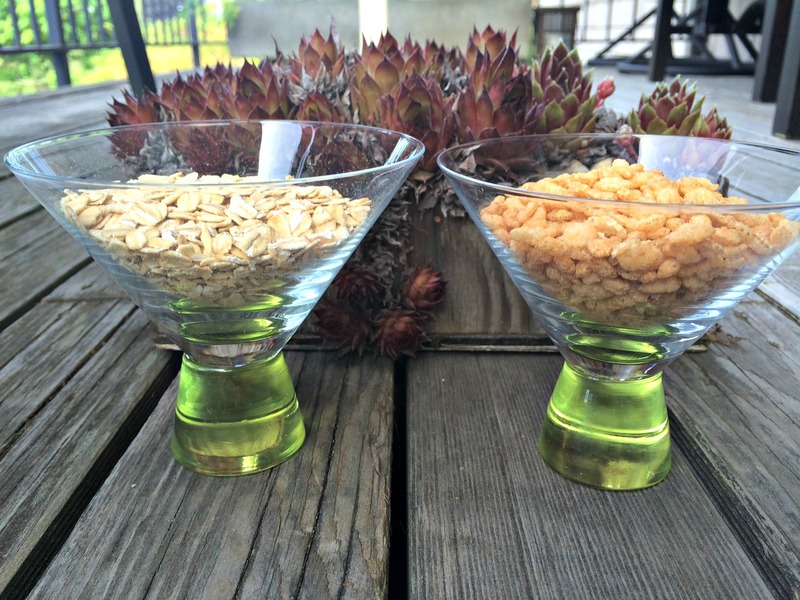 Pick or buy them, wash them and then store them in your container of choice. 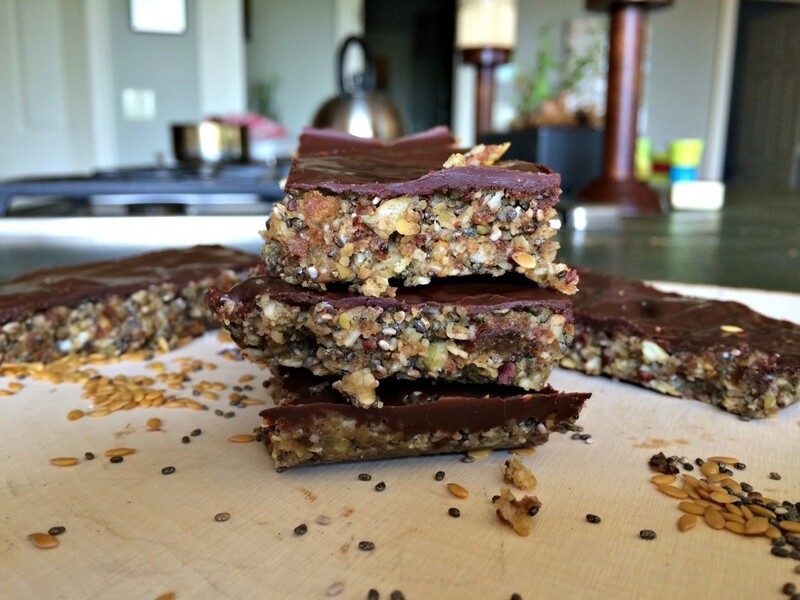 They are a tasty, healthy, sweet alternative to candy and other junk food you might be tempted to pack. Plus they provide a shot of anti-oxidants, vitamin C and fiber. Perfect to keep you regular when your routine is out of whack. Read more about the benefits of eating berries here. 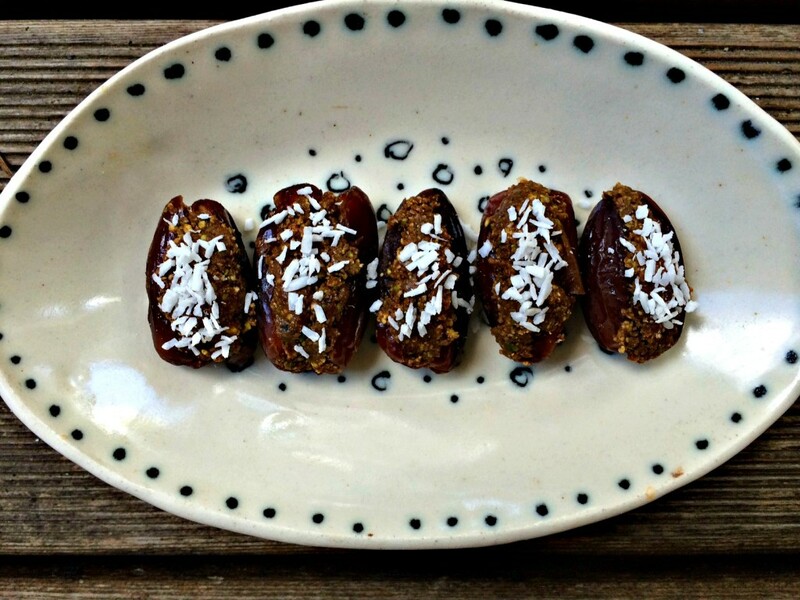 Nut Butter Stuffed Dates. These portable little beauties offer a hint of sweetness with a little bit of salty thrown in. There are currently so many options for different nut butters. I often use pistachio but experiment with what is your favorite. 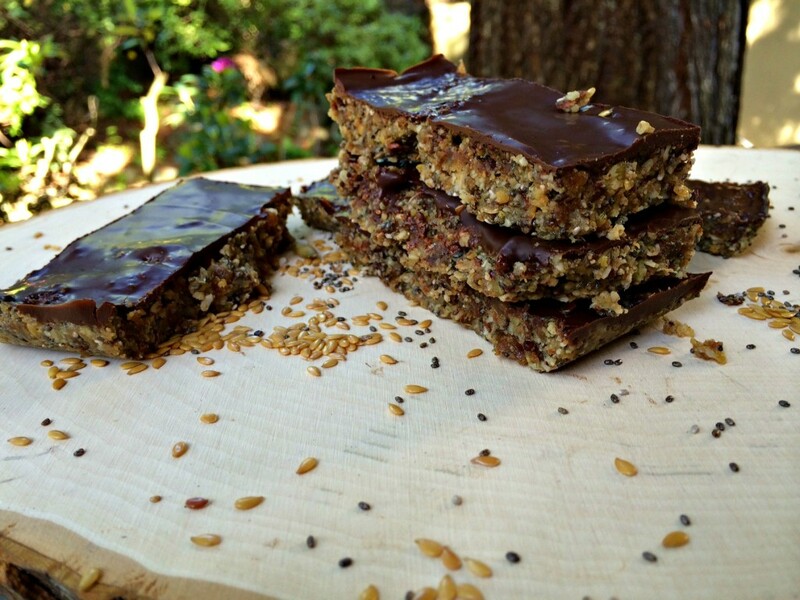 Here is a recipe but they are so simple to create. Just slice the date down one side, remove the pit and then stuff with the nut butter of your choice. Trail Mix. 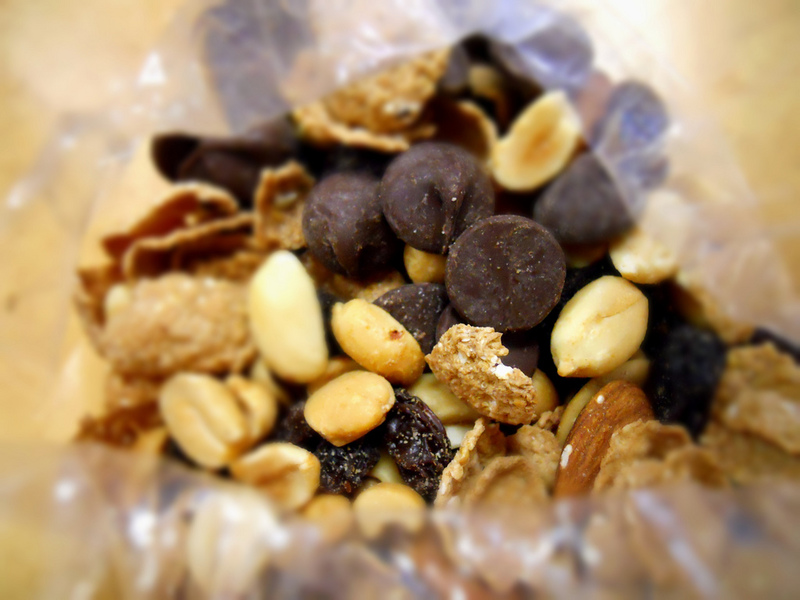 The great thing about trail mix is it can be completely customized to your own individual taste. Take the kids to a store with bulk bins and let them choose what they would like in their own “special” trail mix. 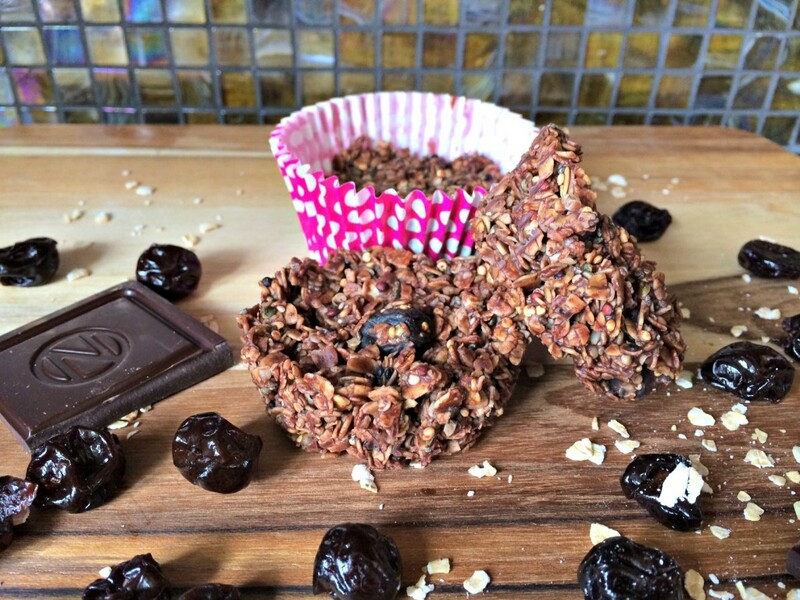 Chocolate chips, nuts, dried fruit, sesame crackers- it is all good! Just be aware that some dried fruits have added sugar. Once the kids have chosen their ingredients, you can pack each kid their own bag of “special” mix. Fermented Blueberry Ginger Soda. This snack takes a little more planning because creating the ingredients for the ginger bug takes about a week. However, having a cool, refreshing, healthy alternative to soda while on the road is well worth it. Plus it will provide your gut with healthy probiotics while you are traveling. 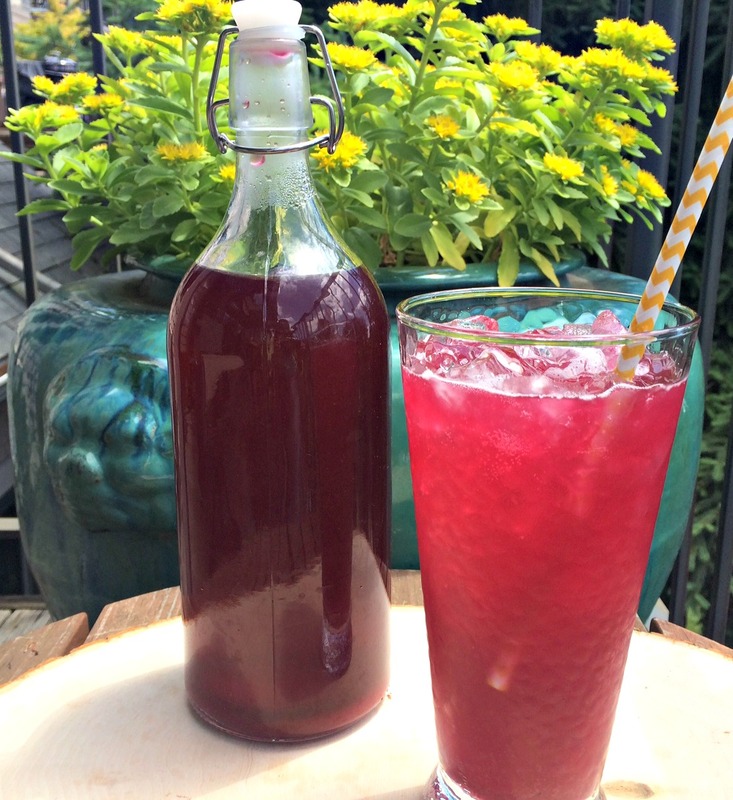 Here is the recipe for Fermented Ginger Blueberry Soda. Yum! 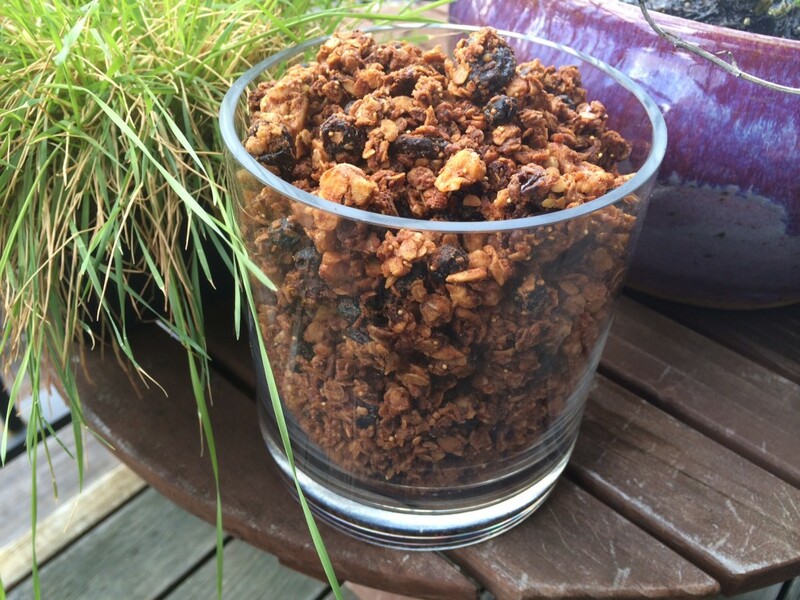 A whole container of granola! 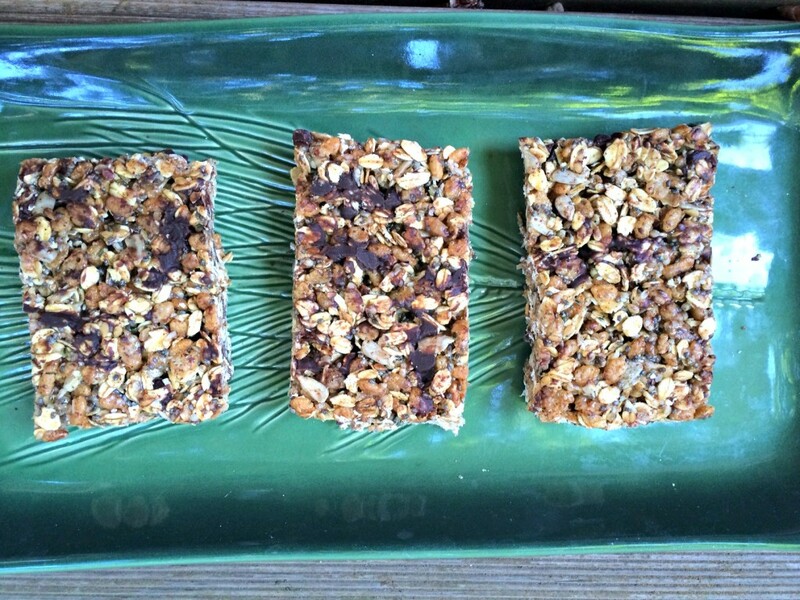 Granola. 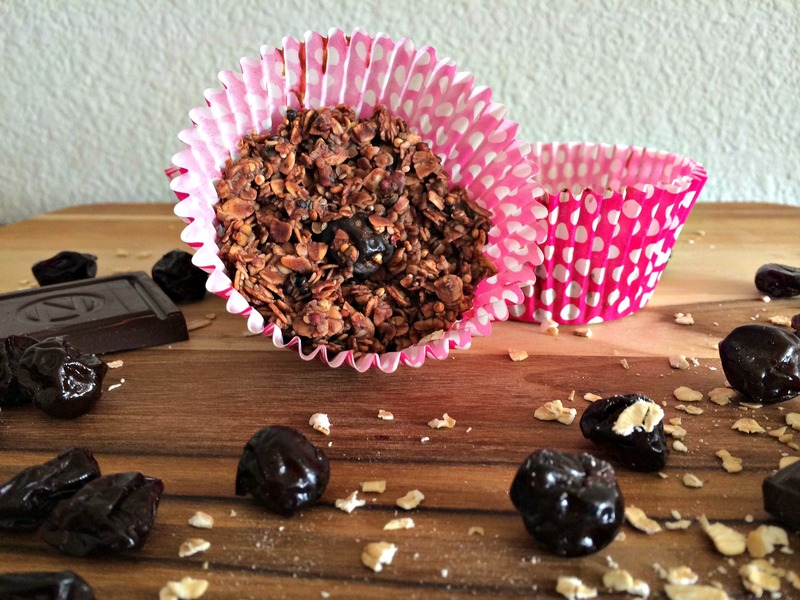 Jane’s Chocolaty Gluten Free Granola is a great road trip food. Portable, healthy and no refrigeration required. These are just a few ideas! I would love to hear about what other families take on their road trips. 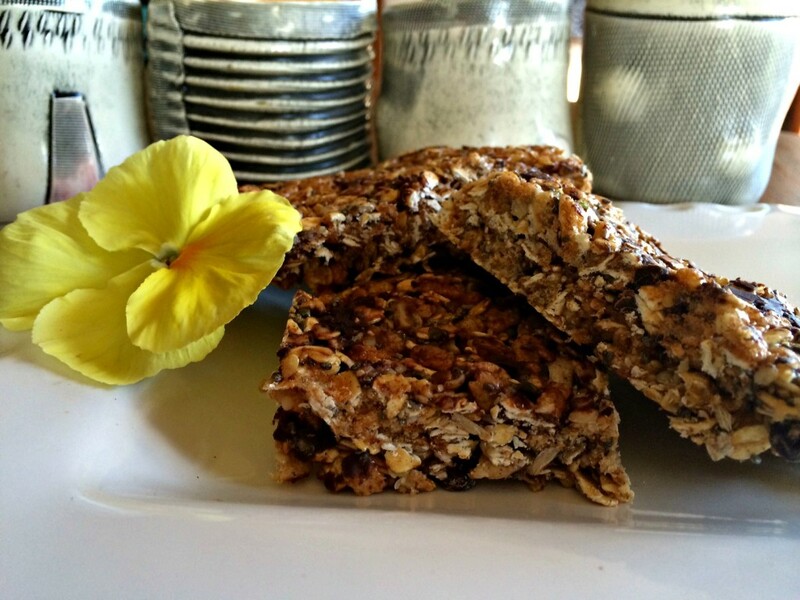 Shared with REal Food Forager, Gluten Free Homemaker, Urban Naturale, Real Food Wednesdays and Allergy Free Alaska. Car Photo by Les Chatfield on flickr with text added by me. Trail mix photo by Sara Milne on flickr. 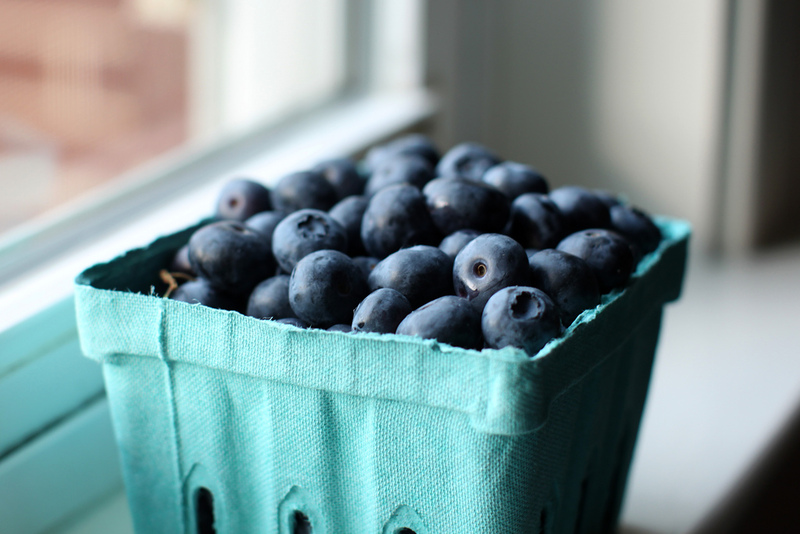 Blueberry photo by Mr. TinDC on flickr. 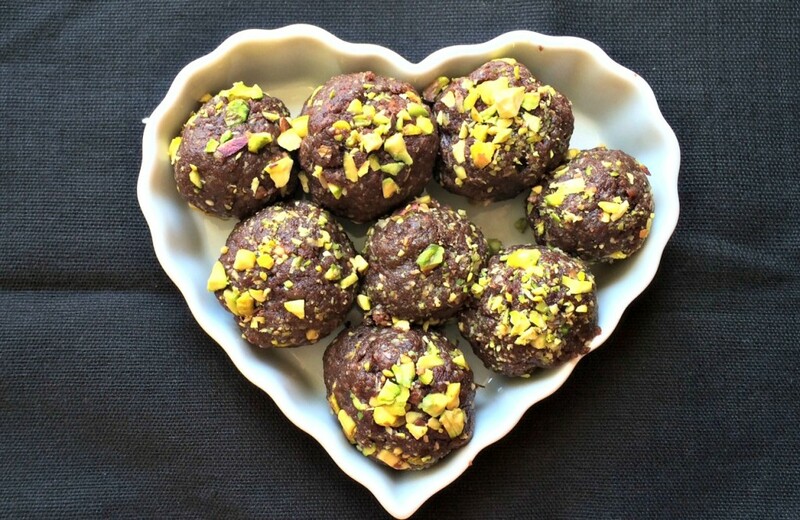 Who doesn’t love a little ball of chocolate protein yumminess? I know I sure do! 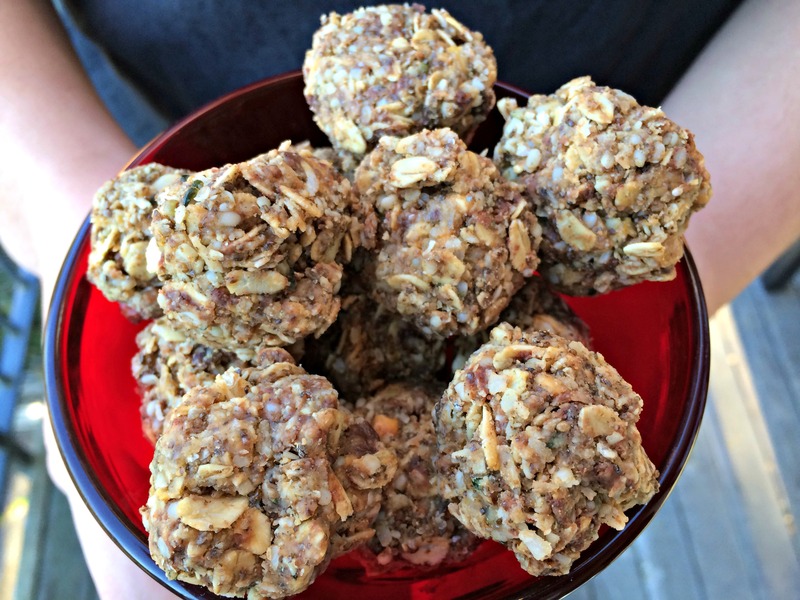 A no bake way to sneak more protein in my diet? Sign me up!! I have been seeing variations of these balls all over the internet and finally decided to break down and try them for myself. They are super easy and quick to make- even little kids can make them. I based my recipe on one I found on the Whole Foods website with a few minor changes. I used almond butter for my Energy Blasts but I know peanut butter or any other nut butter would be just as yummy! I also used dried blueberries because I had them in the house but the original recipe called for raisins. I think dried currants would also be tasty. These balls lend themselves to all sorts of substitutions so don’t be shy about experimenting with your own personal ideal Energy Blast. 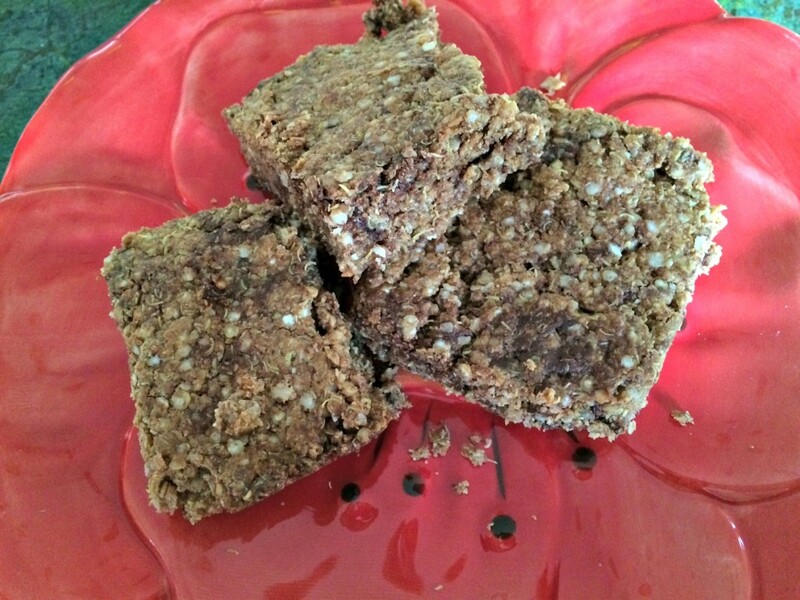 Place almond butter, honey, cocoa powder, blueberries and 2 tbs of coconut in food processor. Put sesame seeds, coconut and walnuts in three separate bowls. Using about a tablespoon of dough roll into a ball until fairly well formed but not perfect. 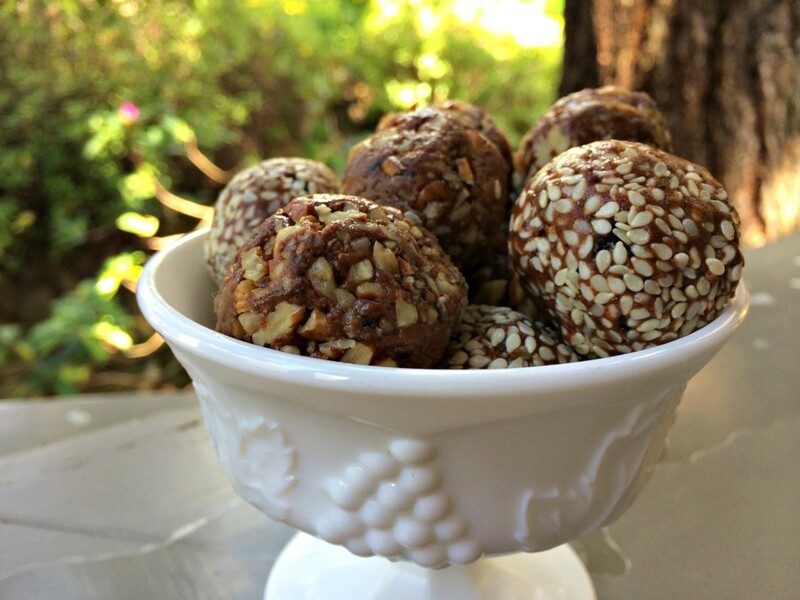 Roll ball in either coconut, sesame seeds or pecans depending on your taste. Continue rolling until reaches roundness. Store leftovers in the fridge. These will get sticky if they get hot. As you can see my kindergarten play dough rolling skills are not that great but these will still taste great even if they are not perfectly round. This post was shared with Food Renegade, Allergy Free Alaska, Natural Living Monday, Gluten Free Friday, A Southern Fairy Tale, Today’s Creative Blog and She Eats. 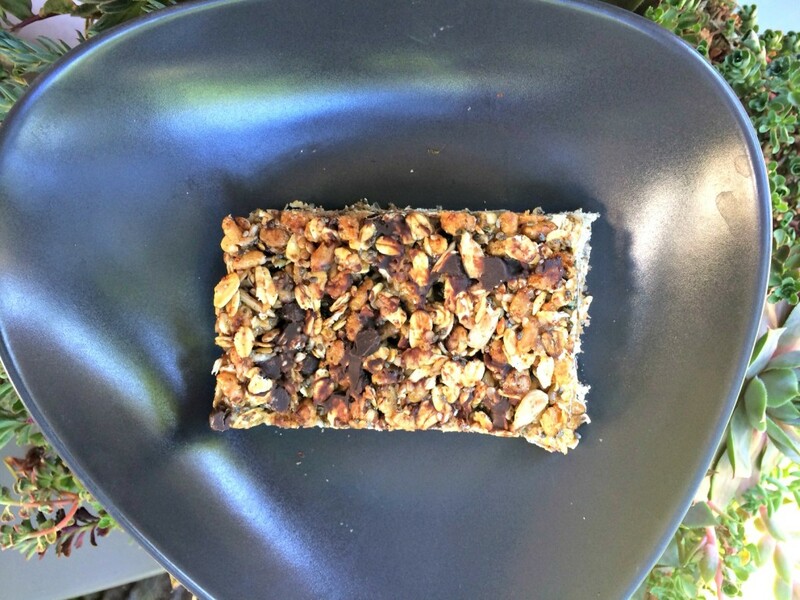 I am always searching for the quick snack that is the perfect blend of salty and sweet-ready on a whim and easy to grab and go. 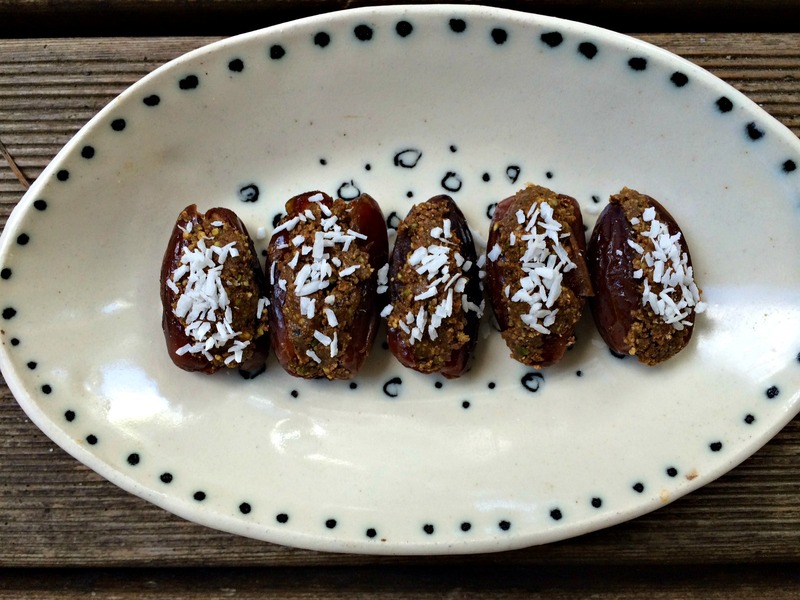 These pistachio nut butter stuffed dates meet those requirements. 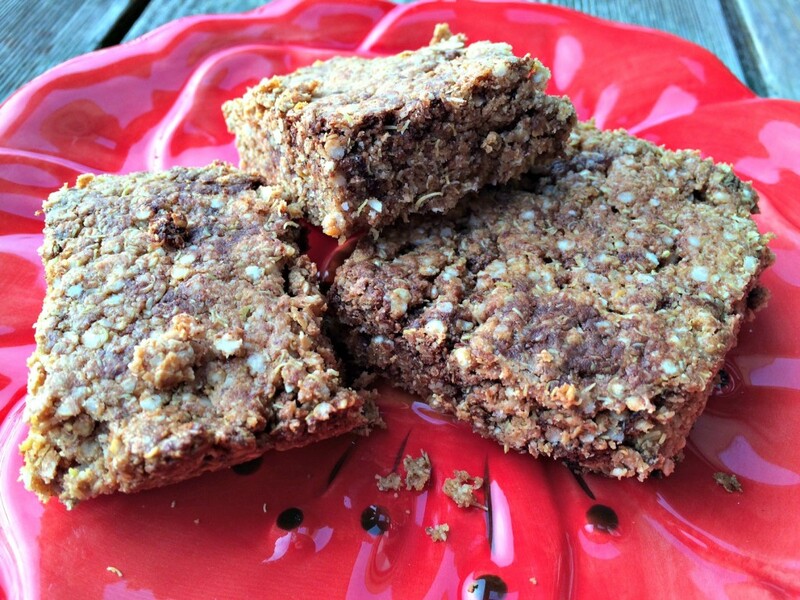 They are so easy to make and can be adjusted to include any nut butter you have on hand. Don’t like pistachios? Make yourself a walnut butter for a blast of healthy omega-3′s. Have a jar of almond butter that has been hanging around for awhile? 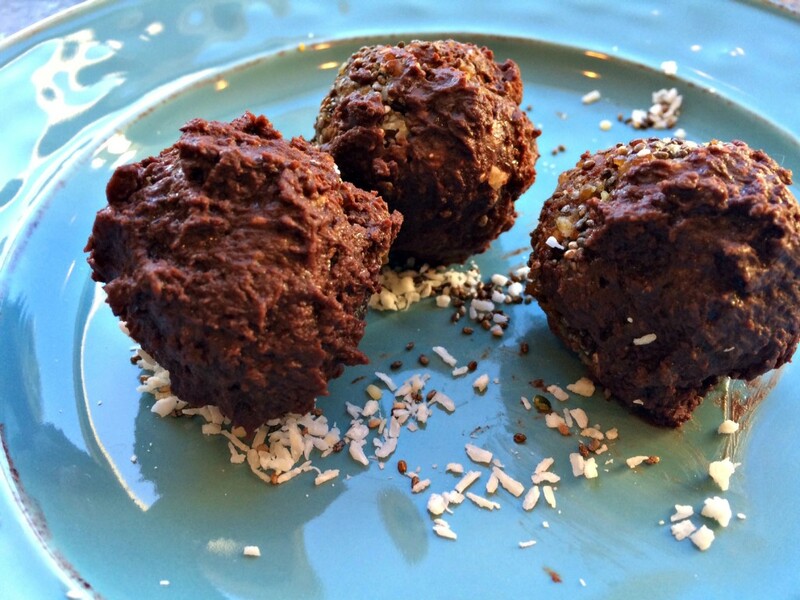 Grab it, stuff it in some dates and chow down. I happened to have pistachios on hand so I decided to make a pistachio nut butter. However, any nut will do. 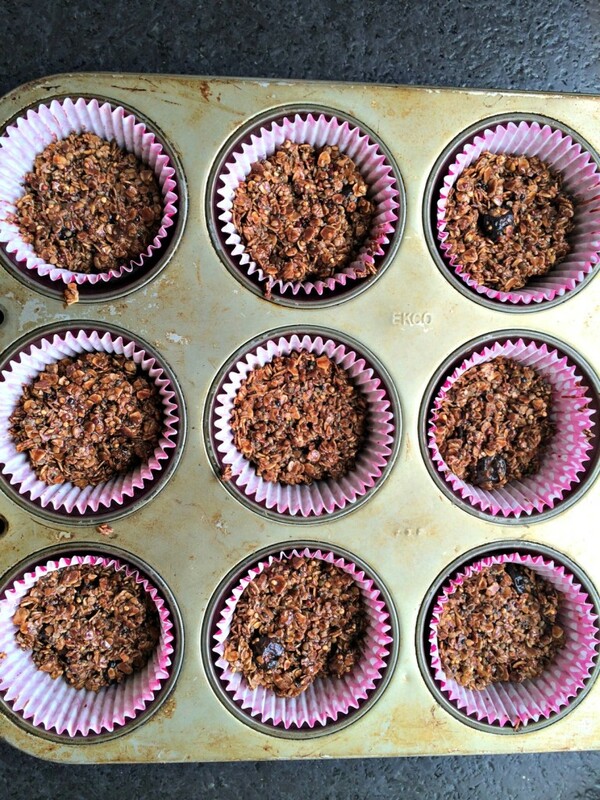 I also decided to add some ground flax seed to add some healthy omega- 3s. Flax seeds ready for grinding. I pre-ground the flax seed in a coffee grinder because I find my food processor has a difficult time grinding them finely. Slice dates down the middle but not all the way through. You want them to open up but not break in two pieces. 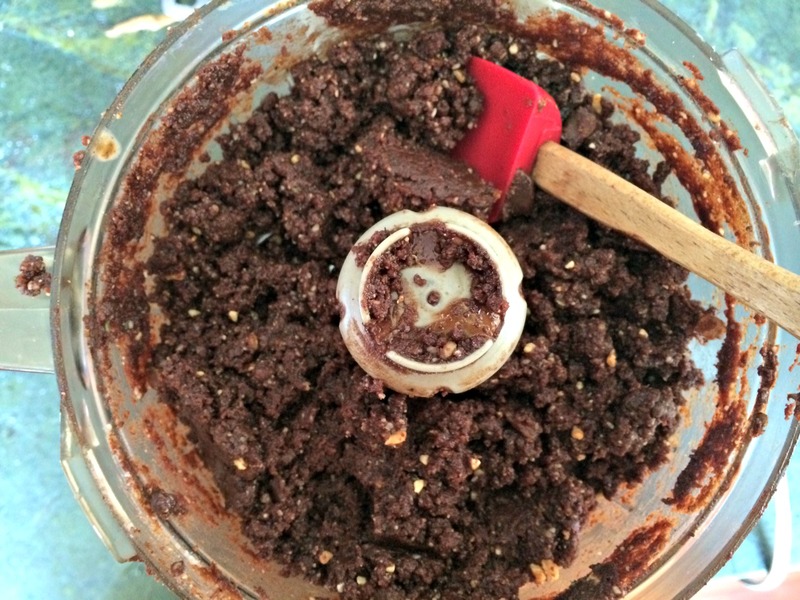 Put pistachios, cacao and salt in food processor. Stop to scrape down sides as needed. 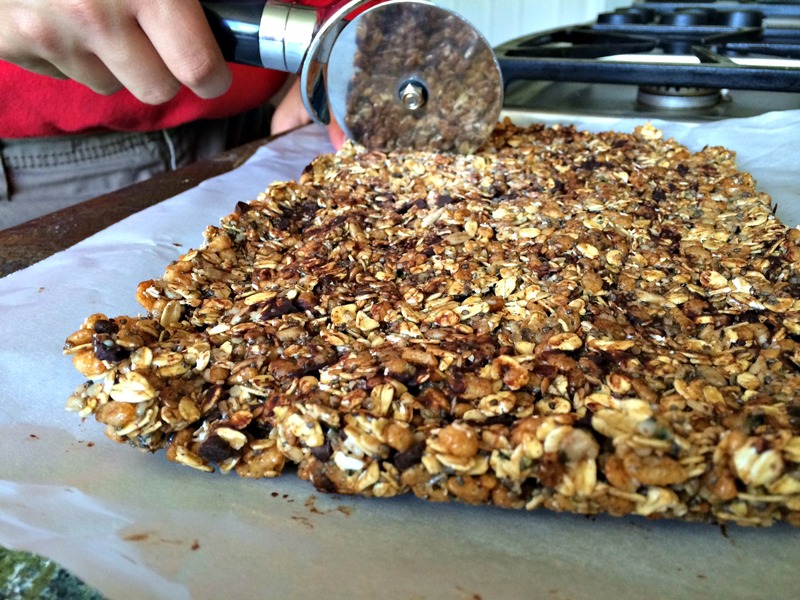 Add oil and flax seeds. Nuts will gradually break down and form a crumb texture. 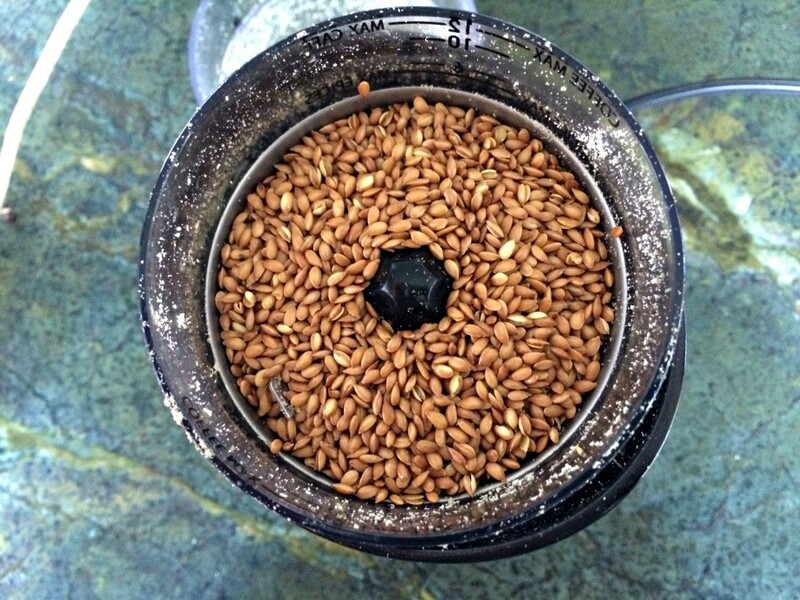 Continue grinding until crumbs begin to stick together and a nut butter forms. This may take a few minutes. Carefully spread nut butter in the inside of the dates. 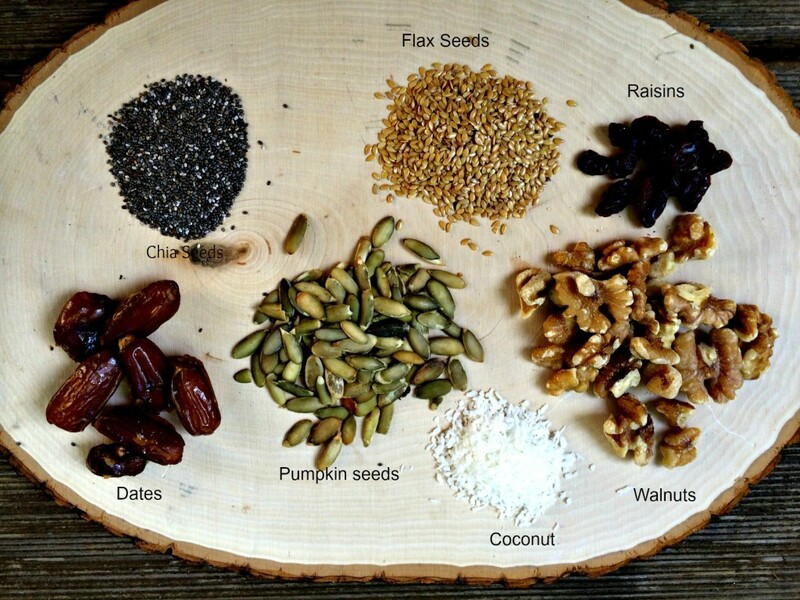 What nut butter would you like to try? Shared with Food Renegade, Today’s Creative Blog, Six Sisters Stuff, A Southern Fairy Tale and The Idea Room.